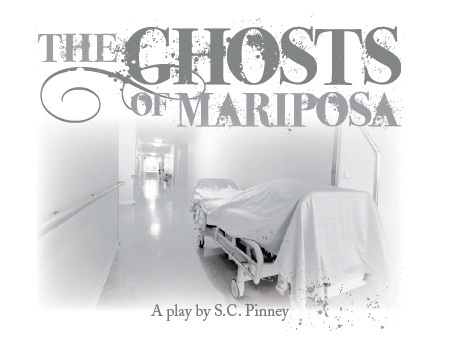 The play The Ghosts of Mariposa began as snippets of dialogue culled from conversations with and between a trio of young men who hung around the Farmers’ Market in Orillia when I was working there as the market’s part-time manager. The animated banter and warm personalities of these men with intellectual disabilities were sifting their way into my imagination and scenes were beginning to appear. Prior to moving north from Toronto in 2002, I had had very little exposure to the world of intellectual disabilities. The lives these people lived were, for me, invisible. Now, they were opening up to me and I was engaged and compelled. There was talk in town about the imminent closing of the local regional center and accounts were being published in local newspapers – heart-wrenching stories – of parents dropping off their five-year-old kids and being encouraged not to return for months in order to ease the transition to the institution. There were hints, at times, of hard conditions and, even, abuse, but at other times, appreciation that this had been a place of sanctuary for families amid very trying times. When I began a support work position at a local group home in the area, I read more and experienced more of some of the men and women who had lived in the Huronia Regional Center. Thousands of people had been assimilated into communities in and around Orillia from Huronia and other area centers in the past few decades. Legal battles were being fought over how best to serve ex-residents right up until the closing of the center in 2009. One of the themes that recurred in the lives of the people I worked with was romantic relationship. Several men dreamed of “getting a girlfriend”, and women dreamed of “getting married” and, though some of their contemporaries were to experience just that, many were unable to fulfill this aspiration. A plaque “commemorating” the site of the town “lunatic asylum” down at the lake helped establish a dynamic (and troubling) historical backdrop for the story. There was a wide gulf between that dark, haunting past (portrayed in movies and novels) and these present individuals I was meeting. All of this merged with town rumours of ghost sightings in the opera house or at the local mansion and gradually the work formed. The play allowed me a place to pour out my anxieties and to celebrate and pay tribute to individuals who were expanding my view of life and testing my understanding of myself and the world. The play, I believe, encourages questions: In a world that believes in “progress” and the evolution of the human animal, how much have our systems of support changed in the past hundred years? What is the role of a support worker, a doctor, medication? What is the role of a municipality, or society, in general, when it comes to these people whose needs can be more extensive than ours? Are their needs all that different from ours? Why do we use so many labels in dealing with people who are different from us? What is the role of family? At the heart of the play (characterized in the pulsing quest of its central character), is a pining for health – a health and peace that must be fought for in a world that often seems prone against it. This entry was posted in The Ghosts of Mariposa and tagged The Ghosts of Mariposa. Bookmark the permalink.